That was the headline over a story – wonderful news, I say, if it’s true – in Israel’s English language newspaper, the Jerusalem Post, on 25 November. On behalf of Zionism’s colonial project in Palestine, the writer, Isi Leibler, was verbally crucifying one of Britain’s most influential Jewish leaders for daring to go public with his criticism of Netanyahu and saying, among other things, that Israel’s policies and actions were harming the best interests of British Jews, and by implication non-Israeli Jews everywhere. The target of Leibler’s attack was Mick Davis. For those who don’t know about him, he is b-i-g in business. 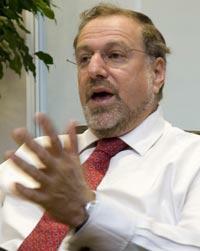 He’s the CEO of Xstrata, a major global diversified mining group (alloys, coal, copper, nickel and zinc) which is listed on the London and Swiss stock exchanges and, in the words of the group’s mission statement, has “the single aim of delivering industry-leading returns for our shareholders”. But there’s much more to Mick Davis than that. “While occupying the role of chairman of the UIJA resident in London, he had the chutzpa to berate the Israeli prime minister ‘for lacking the courage to take the steps’ to advance the peace process, arguing that ‘I don’t understand the lack of strategy in Israel.’ He also employed the terminology of our enemies, predicting an ‘apartheid state’ unless Israel was able to achieve a two-state solution – unashamedly blaming Israelis rather than Palestinians for being the obstacle to peace. Then I had to laugh. Davis’ latest outburst, Leibler wrote, “is neither intellectually challenging nor persuasive.” So why then, I asked myself, was Leibler bothering to address it and, by so doing, give it the oxygen of publicity? The answer is that Leibler is right about one thing. In Palestine that became Israel mainly as a consequence of Zionist terrorism and ethnic cleansing, Zionism is under siege, but not from Arab or other Muslim hordes. Israel is under siege because of its racist policies and criminal actions. Put another way, more and more citizens of the world (if not their governments) are beginning to understand that Zionism’s in-Israel leaders are not interested in peace on terms the vast majority of Palestinians and most other Arabs and Muslims everywhere could just about accept. Even more to the point is that a growing if still smallish number of the Jews of the world are beginning to understand two things. One, even if they cannot bring themselves to read it, is that there is substance to the title of my book Zionism: The Real Enemy of the Jews. The other is the danger (in my view extreme danger) of the rising tide of anti-Israelism being transformed at a point into violent anti-Semitism if they, the Jews of the world and American and European Jews in particular, are perceived as being complicit in Zionism’s crimes. It might be too late save Israelis brainwashed by Zionist propaganda from themselves, but it’s not yet too late for the Jews of the world to save themselves from Zionism’s colonial enterprise and all the evils that came and are still with it. If the de-Zionization of Anglo Jewry and possibly even Western Jewry in general is underway, I think the following question should be asked. What, if anything, can the Gentiles among whom most Jews live do to encourage the process? In the original UK two-volume edition of my book I called for a New Covenant, not between the Jews and their God but between the Jews and the Gentiles. In the three-volume American edition of the book, I dropped the call because I thought on reflection that it was somewhat naive. I’ve changed my mind again and now think the idea for a New Covenant should be back on the agenda. Why, really, do I believe that such a covenant – in spirit at least – is a good and necessary idea? The main reason for the silence of the Jews of the world is the unspeakable fear – the product of persecution through the centuries and, after the Nazi holocaust, Zionism’s manipulation of the fear – that another great turning against them is inevitable. That being so, if only in their sub-consciousness, they perceive the need for Israel as their refuge of last resort. So say nothing and do nothing that could assist Israel’s enemies and put that insurance policy at risk. It follows that if the Jews of the world are to play their necessary part in de-Zionizing Israel/Palestine, they need to be reassured about their security and wellbeing in the lands in which they live. For most Jews these are the nations of the mainly Gentile world. (Most of the Arabs and other Muslims who also live in these lands have always known the difference between Judaism and Zionism. Most Gentiles don’t know). I have just viewed a 15-minute trailer for Mustafa Barghouti’s documentary Our Story. It contains some details which I think invite the conclusion that Israel’s occupation is not only illegal but wicked. The whole documentary should be essential viewing for all Jews everywhere. And I hope that Jews who do see it will be enraged enough to make common cause with Mick Davis and others with the integrity and courage who are speaking out. The original Zionist (nationalist) aim was to create a homeland for all European jews. Palestine was finally chosen because of a mythical claim that it was their ancestral homeland. A claim debunked in Arthur Koestler's 13th Tribe. And they achieved it, but after the initial conflict, refused to make peace with their neighbours. They should have learned from e.g. New Zealand, where the English settlers came to an accommodation with the Maori to share the land. The only 'logical' explanation for this, is that the Zionists are still awaiting the arrival of all the European jews. But its not going to happen, because although the Diaspora may empathise with Israel they have no intention of living there. 'Logically' the Zionists must know this and should settle for a Jewish homeland with international guarantees, and a diaspora made secure by supporting democratic institutions and not having to defend the actions of extremist Israeli governments. Their problem is, the failure to make peace is destroying the Zionist project, by changing the demographics of Israel. And it is this change that will lead the Zionist lobby (despite its apparent omnipotence) to suddenly collapse, like the Berlin Wall. This is because in order to pursue the conflict, Israel has looked around for other jews and non Jewish jews to boost numbers and man the factories. This has led to a rise in the ethnic Arab Jewish population (the real Semitic jews! ), Russian non Jewish jews (said they were jews to escape the Soviet Union) and other nationalities as 'guest workers'. This process, which takes time, is changing the face of Israel from a European to an Arab/mixed one and will eventually turn Israel into just another country in the Middle-East. And this trend is leading to the de-Zionization of Anglo Jewry. Well, money sure talks! Perhaps if the Goyim have caught wind of the reality of Zionism, those wealthy Jews may be getting hurt in the pocket. Zionism may have been sold to these people by claiming it would bring them money. But with the continued siege of Gaza and Israel's zeal for a war with Iran, Israel is more than ever the Dirty Old man of World Politics to the gentiles of the world. If Zionism is a financial liability to these wealthy folk, then they may drop it like a hot potato. It seems Leibler has good reason to panic. Without the support of the wealthy & influential, Zionism will evaporate to the benefit of the world. The outrageous comments made by Liebler included the fuss about rockets and delegitimisation too. Netanyahu and Sen Joe Lieberman can make speeches with every sentence a lie. I fully agree with your analysis, thus have nothing to add, except to suggest everyone read your equally powerful book. Who do you think you are kidding? If there were any real Zionists they would be in Israel. Truth is almost no American or European Jews even want to go there on a visit. There can be no cevenant between Jew and Gentile because the concept of Jew and Gentile is a Jewish thing, it would play into their fantasies. It would be like asking the rest of humanity to make covenant between muslim and kuffar, the term only exists in Islam, no it is on their heads to relinquish a barbaric belief or suffer as they deserve to suffer, in return for the suffering they cause. David Durant: "A claim debunked in Arthur Koestler's 13th Tribe." Er, no. Modern genetic research refutes the idea that any but a few at court in the Khazar kingdom converted and transmitted their genes to today's Jewry. Koestler was probably sincere, while enjoying mischief-making, but anyone who still talks about Khazaria as the real place of origin of Israelis is 'avin' a larf. My interest in all this is the 'centuries of persecution' and 'irrational hatred' schtick. Ever since Flavius Josephus, the unpopularity of Jews among their gentile hosts and neighbours has been a recurrent theme of history. The Jews pitch up in a new country, get persecuted into positions of wealth and influence, then get kicked out or worse. Is it really ALL down to blind prejudice... or does it ever occur to the more thoughtful of them that, you know, they might be doing something wrong? Oh no! Perish the thought! Evil Nazi Alert! As David Irving sometimes implies from known facts, Mr. Liebler is hiding behind the Australian citizen apron.A sad day that of all the terrible history of the world The Holocaust is soon to be part of the schooling.The Jews in Australia and there more self-announcing supporters are simply also hiding from the world.From the comfort of the silliness of their historical claims about family and self.Until David Irving is allowed into Australia,consider Australian Jewry riding boastfully on being victims.I think this is a PR disaster for Australia. I can readily accept that the '13th tribe' should not be taken literally. After all it was written by a communist in dispute with the zionists for the jewish soul. The 13th tribe myth was promoted as an alternative to the holy land myth. But it did draw attention to the existence of a large thriving jewish population in Russia and Poland, that spoke Yiddish and had no historical blood ties to the Holy Land.